Bugaboo is the very first global brand to host its own collection. Within the Bugaboo collection, users can find special spots such as parks, shops, museums, cafés, restaurants and playgrounds that cater to modern parents on the move. The current collection features upwards of 350 spots in cities including Amsterdam, Berlin, Barcelona, London, Paris, New York and Los Angeles. “Bugaboo is all about inspiring people to get out and explore the world. By hosting this collection we want to offer our customers an easy way to find great places wherever they might be and invite them to share their own. We are looking forward to expanding this collection to other cities as well, together with our users”, says Madeleen Klaasen, Bugaboo's Chief Marketing Officer. The Bugaboo collection can be found within the promoted section of all mobile applications, by searching for Bugaboo or here: http://whatser.com/users/8074. 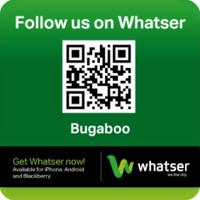 Whatser is available in public beta, for the iPhone, Android and BlackBerry. All content is fully accessible through http://whatser.com. To start a collection as a brand, visit http://whatser.com/partners/brands. Screenshots are available upon request or can be found at http://whatser.pressdoc.com. To watch a Whatser introductory video, visit Vimeo (http://vimeo.com/21436173). Bugaboo is a Dutch mobility company headquartered in Amsterdam with offices around the globe. Bugaboo products are now available in almost 50 countries. For more information, visit bugaboo.com.